John Molloy Gallery is pleased to announce “GEOMETRIES, American Geometric Abstraction 1880 – 2016”, opening January 14th, 2016. The exhibition adds a new dimension to this canon in American Art with the inclusion of Plains and Plateau Indian Parfleches from the 1880s to the early 20th century. Fifty years before Ilya Bolotowsky made his work, these rawhide objects were painted with geometric motifs and primary colors, using a visually similar pictorial language. The lines, shapes, composition and color of the Native American works provide a stunning comparison to the more contemporary works included here by such artists as Bolotowsky, Betty Parsons and Larissa Nowicki. Comparisons between indigenous and modern art are classic art historical conversations, with our understanding of each body of work enriched by an enlarged context. 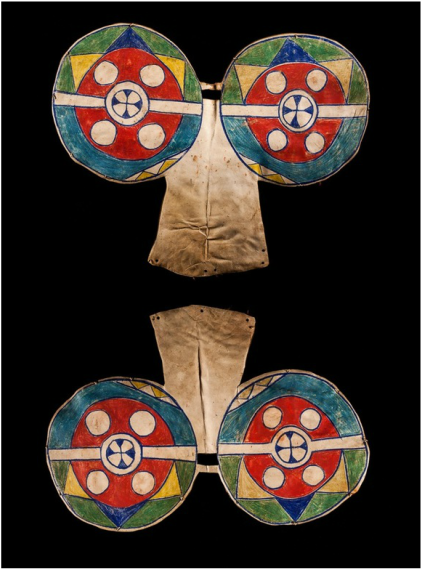 “GEOMETRIES” includes a collection of painted parfleche from various tribes, including Lakota, Umatilla and an especially notable pair of historically and artistically important Crow Indian horse armor. This is only one of three pair extant. The bold colors and form as well as the abstracted celestial imagery make this beautiful pair a significant statement in the history of American abstraction. It is a striking companion to the large “Rising Tondo” by Ilya Bolotowsky from 1968, as well as to the Betty Parsons mixed media “Eye of the Cross” from 1976. Parfleche is painted in what was essentially a fresco technique. The intensely saturated color is as bold and vibrant as the commercial pigments used by the later artists on canvas or wood. The circular motif and saturated color is reflected in Andy Hammerstein’s painting, “Sunspot,” and again in new work by Larissa Nowicki. Meticulously woven paper constructions are Nowicki’s signature geometric vocabulary. The Betty Parsons mixed media constructions from the 1970’s share the spontaneity of the parfleche paintings, and make reference to the natural world. Painted wooden geometries of a different sort are found in new paintings by Max Estenger, whose work is in a group show at the University of Denver Museum, “Learning to See Color” from January 14 to March 6, 2016. Estenger is having a mid-career survey at the Museum of Contemporary Art in Tucson, AZ from February 13 to May 29, 2016. Cognitive science confirms that the bold colors and shapes used by all the artists exhibited here reach beyond cultural boundaries to specific neural receptors in our brains. From a purely visual perspective, before any discussion of intent or influence, this exhibition broadens the category of American Geometric Abstraction in America. ​“GEOMETRIES" opens with an artists' reception Thursday, January 14th from 6-8 pm and runs through February 27th, 2016. 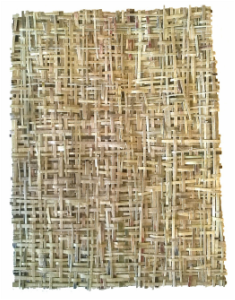 Larissa Nowicki, untitled, woven paper, 5 x 6 3/4"